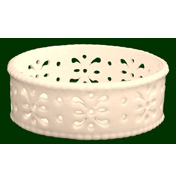 Welcome to the Royal Creamware Shop where we have exclusive access to the remaining range of Creamware. 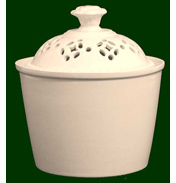 With its original roots in Leeds, Classical Creamware as originally was named, changed its title to Royal Creamware. It then moved to Newton Aycliffe, County Durham in the North of England where it quickly established itself as a leader in pierced ware and creamware production. When the established chintz firm of Grimwades bought out the company, the production moved its base to Longton, which is one of the five pottery towns known as ‘The Potteries’. The Potteries generally are known as a federation of five towns, when it is actual fact the six distinct towns of Hanley, Burslem, Longton, Stoke, Tunstall and Fenton. All of these are centred on the main town of Stoke on Trent, which is situated on the river Trent in the very heart of England near to Birmingham. Manufacturing pottery was established in the area Stoke before 1600 and began to flourish in the 17th century because of its natural resources of clay and coal. Clay needed for the pottery and coal required to fire kilns. By the late 1720’s white ball clay was brought in from Devon and Dorset and after 1775 white china clay was imported from Cornwall in what became English china clay. 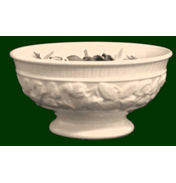 Highly popular in both the United Kingdom and the United States the pottery ‘Leedsware’ as it is also known is synonymous with the perception of history and style. 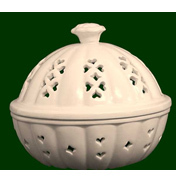 Royal Creamware kept faith with this concept producing pieces that were not only functional but also pleasing to the eye and likely to be treasured by future generations. This handcrafted Leedsware china is highly collectible and was uniquely created to the 18th century specifications. 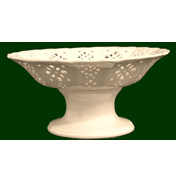 Each piece was individually crafted by the potters in the Royal Creamware factory in England and where the design required, the pottery was pierced by the craftsmen forming patterns of what was known as openwork. This piercing was done whilst the pot was still in the soft clay stage using a small shaped metal cutter and it was done without a pattern by hand. These patterns of openwork required a great deal of concentration, a steady hand and a keen eye to perfect and many a piece was discarded if it did not meet the required quality. Interestingly, it is quite often possible to see whether the person was left or right handed when piercing was completed by viewing the angle of cut on individual holes. Many examples of different shaped holes used for piercing can be seen, usually lineated to conform to the piece in question such as hearts, clubs, triangles, leaves, flowers, slots, rounds and squares. Indeed in typical pieces some used a combination of different shapes. After piercing, pots were allowed to dry or cure before firing. Any leftover clay from the piercing or other cutting processes could be returned with addition of some water and mixed for re-use. 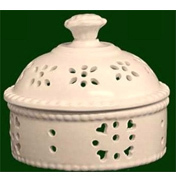 On creamware it is very important that the whole process is kept scrupulously clean so as to prevent the formation of something called ‘speck’ on the pot surface. This would ultimately be seen on the finished item, as the finished glaze is semi translucent and therefore another reason for cleanliness as any early fault can be seen on the finished pot. Because of the care required during manufacture it is easy to see why items take so long to make and why they ultimately have the individual natural beauty of a handmade item. As can be imagined with ‘hand making’ every single item has its own individuality quite unlike machine made pottery where every pot is totally the same. 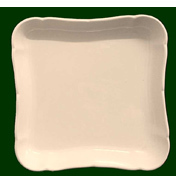 So each piece of Royal Creamware fine china is made with loving care and is completely unique. 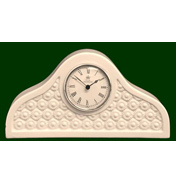 The Royal Creamware Pottery range is subdivided into Classics, Occasions, Originals, Masterpieces, Art Deco together with Clocks and Teapots. 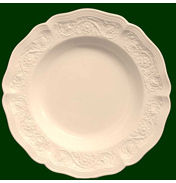 Within Classics includes dinnerware items such as dinner plates and tureens. Occasions has a wide selection of giftware to choose from, and Originals being the more superior pieces of the collection. 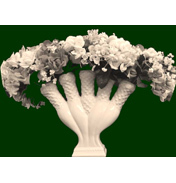 The Art Deco range is where you will find items such as vases. Clocks and Teapots of course speak for themselves.